The Steelers and Bengals had plenty to say to each other on the field during Pittsburgh's last-minute, 28-21 win on Sunday at Cincinnati, and the Steelers had more to say on Monday, particularly about a hit on their star wide receiver, Antonio Brown. Brown, who scored the winning touchdown on a 31-yard pass with 10 seconds left, absorbed what appeared to be an elbow to the head from longtime nemesis Vontaze Burfict. The Cincinnati linebacker has been fined and suspended multiple times for hits and tackles that crossed the line from hard play to cheap shots. Steelers right tackle Marcus Gilbert called Sunday's play "pathetic," adding, "The NFL has to do something about that." 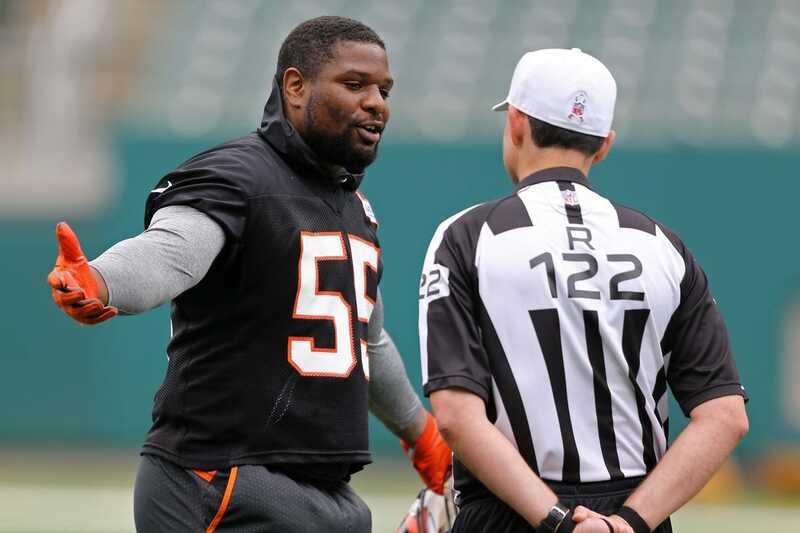 The NFL is studying Sunday's blow to head by Burfict and two other plays in which he led with his helmet, according to ESPN's Adam Schefter. --Buffalo Bills rookie quarterback Josh Allen is "week-to-week" with a throwing elbow injury, and his status is uncertain for Week 7, coach Sean McDermott told reporters. McDermott declined to offer details on what type of injury Allen is dealing with. Allen left the game against the Houston Texans in the third quarter Sunday after being hit on the elbow by Whitney Mercilus, a hit McDermott was upset the officials did not flag. --The Oakland Raiders would be willing to part with wide receiver Amari Cooper if they can get a first-round draft pick in return, NFL Network's Ian Rapoport reported. Schefter reported before the Raiders' game on Sunday in London that Oakland was shopping Cooper and fellow former first-round draft pick Karl Joseph, a safety, ahead of the NFL's Oct. 30 trade deadline. --Microsoft co-founder Paul Allen, the owner of the NFL's Seattle Seahawks and NBA's Portland Trail Blazers, died Monday of non-Hodgkin's lymphoma. He was 65. Allen tweeted on Oct. 1 that his non-Hodgkin's lymphoma, which he fought in 2009, had returned. Allen co-founded Microsoft with Bill Gates in 1975 and later founded Vulcan, Inc. He purchased the Trail Blazers in 1988 and the Seahawks in 1996, and also helped found Major League Soccer's Seattle Sounders in 2009 as a part owner. --The Tampa Bay Buccaneers fired defensive coordinator Mike Smith, replacing him with linebackers coach Mark Duffner. Tampa Bay sits 31st in the NFL in yards allowed (439.8) and dead last in yards per play (6.9) and points allowed (34.6). --Police in Foxborough, Mass., have charged a Gillette Stadium fan who threw beer onto Kansas City Chiefs wideout Tyreek Hill on Sunday with disorderly conduct and throwing an object at a sporting event. The New England Patriots announced earlier Monday they had identified the fan, banned him from their stadium and turned the matter over to law enforcement. As Hill's momentum carried him through the end zone and up against the railing of the end-zone seats, he was immediately met with numerous middle fingers before a fan threw beer into his face. --Atlanta Falcons rookie receiver Calvin Ridley was diagnosed with a bone bruise after an MRI exam was conducted on his left ankle, according to an NFL Media report. Ridley, a first-round selection, was injured during the second quarter of Sunday's game against the Tampa Bay Buccaneers. Head coach Dan Quinn said he's "hopeful" Ridley can play next Monday against the New York Giants. Meanwhile, the Falcons have ruled out running back Devonta Freeman (foot, groin) and kicker Matt Bryant (hamstring) for Monday. --The Cleveland Browns escaped a major injury to their quarterback on Sunday, but wide receiver Rod Streater is out for the season following a neck fracture and linebacker Joe Schobert will miss time, coach Hue Jackson said Monday. Jackson told reporters Baker Mayfield is "fine" and expected to play in Week 7. The quarterback played through an ankle issue in Sunday's loss, an injury sustained midway through the first quarter when he slipped on the line-to-gain marker on the sideline after scrambling. --Disgruntled holdout running back Le'Veon Bell did not show up for player meetings with the Pittsburgh Steelers, and the team does not expect him to appear this week, according to multiple reports. The Steelers, who are entering their bye week, next play Oct. 28 against the Browns. --Minnesota Vikings first-round cornerback Mike Hughes tore the anterior cruciate ligament in his left knee on Sunday and will miss the rest of the season, coach Mike Zimmer confirmed. Hughes went down midway through the fourth quarter clutching his knee, which buckled awkwardly to the outside as he turned to break left while covering Arizona Cardinals wideout Larry Fitzgerald. --Tennessee Titans outside linebacker Derrick Morgan will miss multiple weeks after sustaining a shoulder injury Sunday against the Baltimore Ravens, coach Mike Vrabel said.